Ron joined VAWC in late 1955 as a 14 year old. Like so many of our walkers, he came from the Collingwood Harriers club. His walking career lasted some 20 years and perhaps his greatest achievement was to gain 2nd place in the Malaysian 20 km Championship in 1965 while serving overseas in the Australian army. He retired from competition in the seventies and turned his attentions to managing junior teams at the Collingwood venue and officiating. He did the first exam for walk judges when the Little Athletics movement started in 1967. He has been an AV official since the early seventies. He has been coaching for some 40 years. 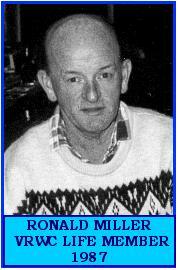 For his services to the many clubs with which he has been associated, Ron has life memberships of VRWC, Collingwood Harriers and Collingwood Little Athletics Club. Within VRWC, Ron has been on the Committee for many years. He served as secretary for 12 years, from 1989 to 2000. It was during this time that we lost our clubrooms and the club went through a particularly low period. Ron was one of the hard workers who helped the club come through that period and regroup at its new headquarters at the Middle Park Bowling Club. As well as being Secretary, Ron has been race secretary for many years and has, perhaps, a greater working knowledge of the club than any other current member.